Public Art Maps Now Available! What better way to explore a city than through the eyes of an artist? 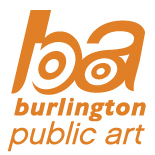 The City of Burlington public art program is pleased to announced the launch of its new public art map. Grab a map and explore the over 75 public art sculptures, murals, benches and bike racks that can be found throughout the city. The maps can be found at many locations including the Visitor Centre, City Hall, Burlington Art Gallery, libraries, community centres and more! This entry was posted on April 2, 2018 by burlingtonpublicart.